And for each bit of spam, check the box next to it down the left-hand side. Then select Mark as Spam from the Bulk Actions menu. Then just continue with the next page of Comments and repeat. The recognised way to stop comment spam is to use Akismet, which is one of only two plugins that comes pre-installed with Wordpress. However, while effective, that requires an annual subscription. 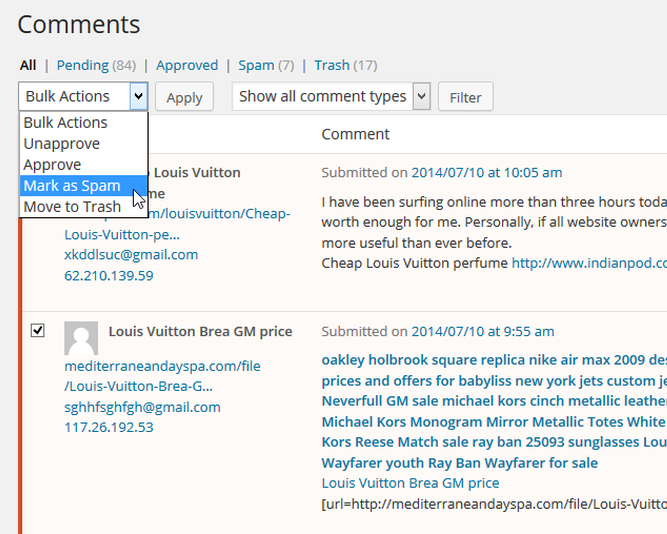 Recently, I've found considerable success using a plug-in called Anti-Spam for Wordpress, which is free. It's relatively low-tech and in due course, if it becomes popular enough, spammers will undoubtedly start to find a way around it,but for now it seems to be working very well on 100% of the sites on which I've tested it.